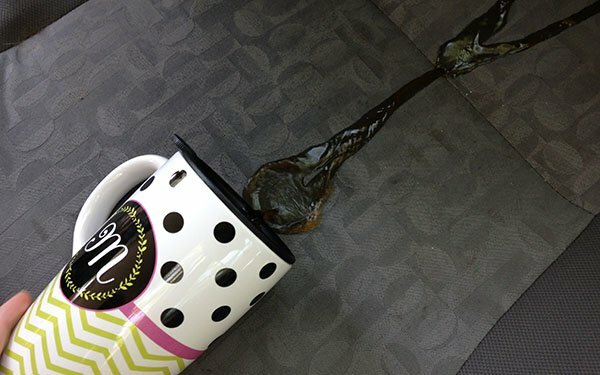 Almost every driver has a dirty little secret: a car marred by spilled coffee. Sometimes the cup holders catch most of it. Sometimes a little gets on the carpet. And sometimes your coffee goes allll over the seat. Unless you have mocha upholstery, this is a big problem. 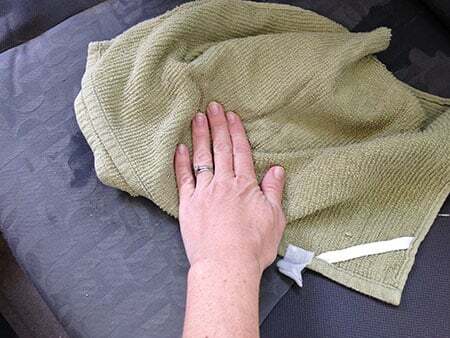 We’ll show you how to remove coffee stains from your car seat in five easy steps. 1. Spill coffee on your seat. Yes, we really spilled coffee on our car seat for you. That’s how much we love our compare.com users. 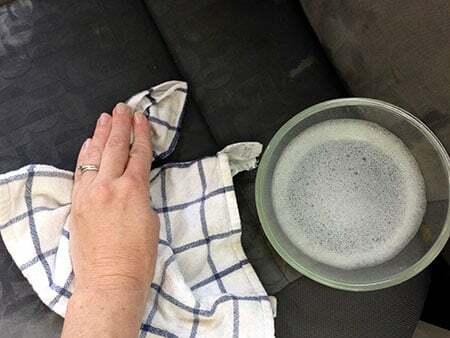 If you’re searching for ways to remove stains from car seats, you’ve probably already checked step one off your list. To avoid doing this in the future, invest in a spillproof travel mug. Or maybe a more stable cup holder. 2. Act fast! Blot the coffee as quickly as you can. If you’re in a hurry to get to work or school, you may be tempted to just let the stain dry and deal with it later. Resist the urge, because a fresh spill is a lot easier to clean up (and smells much better) than stale, dried coffee. 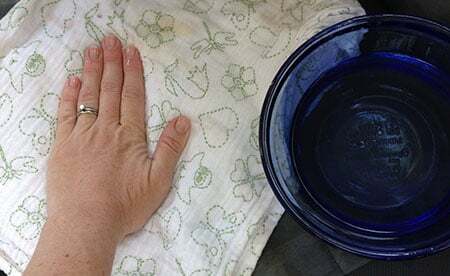 Grab a paper towel, cloth, baby wipe or whatever you have handy and try to soak up as much as you can. 3. Gently rub with a mixture of dishwashing soap, vinegar and water. Now my car smells like a coffee salad. Several car cleaning experts recommend a solution of approximately one third vinegar, two thirds water and a few squirts of dish soap. 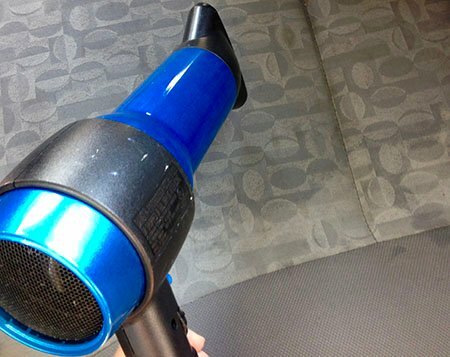 You can also use a spray-on upholstery cleaner. Apply this solution to the stain and then rub gently with a clean sponge or dishtowel. While you’re doing this, inspect the door trim, cup holders and carpet and wipe down any spilled coffee you find there. 4. Rinse with clean water and blot. Don’t skip this step! While you don’t want to completely soak the seat, rinse as well as you can. Keep blotting until no more brown coffee stains appear on the dishtowel or cloth you’re using. 5. Blow dry the wet area. Dry the wet seat with a hairdryer, set on low. If it’s a hot and sunny day, you may be able to get away with leaving your windows down. Just make sure no storms are on the horizon. Some people say you should apply a beaten egg yolk to stubborn coffee stains, then wipe it off and rinse with water. Make sure you clean it off thoroughly, or you’ll have an even stinkier car. If you spilled a latte, you’ll have to use special products to clean up the dairy before you tackle the coffee itself with the steps above. Wikihow recommends using an ammonia and water mixture, then applying some enzyme detergent and letting it sit for 30 minutes. If a sour-milk smell persists, professional cleaning may be the only way to go. If a stale coffee smell persists, you can fight it with baking soda, coffee beans or a commercial-strength odor absorber. Lastly, just do the best you can. Even if there’s a slight stain left on your car seat, no one will notice it. If you want to see some really filthy cars, check out the before-and-afters from Richmond car-cleaning company Car Pool. Don’t you feel better now?